Protecting pangolins from the wildlife trade is a difficult task. From rescuing them from animal traffickers to keeping them healthy and alive, each part of the process requires great effort and care. One example is when 98 pangolins were rescued by the forest protection branch of Móng Cái City in the northern coastal province of Quảng Ninh in September, the Kinh tế & Đô thị (Economic and Urban Affairs) newspaper reported. The night ride taking the pangolins from the province to the Hà Nội Wildlife Rescue Centre was a nerve-wracking one, said Lương Xuân Hồng, the centre’s director. “We were escorted by one of the forest rangers’ cars,” he told Kinh tế & Đô thị. “It was a 100km-long winding road in total darkness and not a single person in sight, just a few container trucks delivering goods to the borders. Luckily nothing happened, and the rescue team reached their centre at 5.30am. Despite being exhausted, the rescuers did not leave the centre until they examined all pangolins, classified them, and put them into their cages. The centre is where the pangolins are nurtured back to health, a process that takes months for those that are severely injured. Since pangolins are such a sensitive species, trying to force feed them is a no-no, said Trịnh Thị Thu Hằng, a vet at the centre. “We have to check up on them every day and have different care regimens catered to each individual,” she said. “The majority of the 98 rescued pangolins had intestinal damage and suffered from stress and dehydration, so they needed water injections and medicines for 7 consecutive days. The centre formed a special care team with 9 members, who took turns supervising the pangolins and making sure they receive timely treatment for any unusual symptoms. “Rescuing pangolins is hard, keeping them healthy is several times harder,” said the centre’s director Hồng. 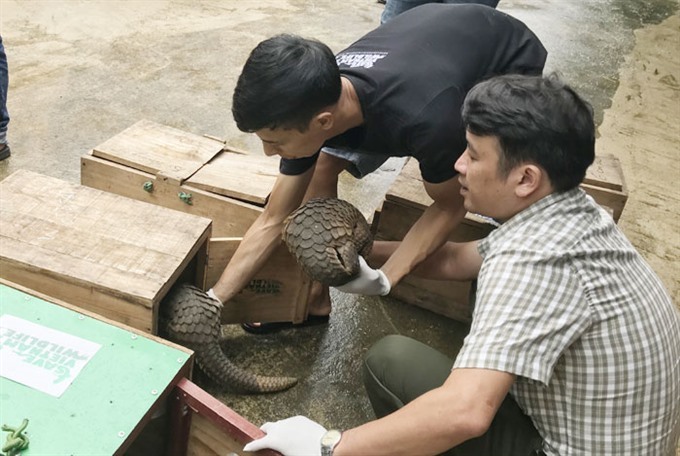 After 8 days of intensive care, on September 14, 73 of the pangolins were transferred to the Centre for Rescue, Conservation and Biological Development at Cúc Phương National Park, Hồng added.